I started the 2nd day of the Microsoft Tech Days with a level 400 session. You can see how many read/writes each table receives and how the SQL optimizer does clever things behind the scenes. Example: removing joined tables from the execution when it isn’t part/effects of the result. Query plan must be read from right to left (already knew that, but not everybody does). User-defined functions are a black box for the SQL optimizer. This can affect the actual query plan. Table valued user defined function returns a table are better for the optimizer (no scalar value), but doesn’t solve the duplicate code issue. Inline table valued user defined functions delivers statistics to the SQL optimizer. From a conceptional point of view this is actually a parameterized view (=macro). This delivers the performance you need, but can be hard to write. You need statements with CROSS APPLY. Not actually part of the topic: COALESCE(..expression..) is the better version of the ISNULL(..expression...) function. There are not a lot of session about this topic (and thorough documentation is not available). Mads is the founding father of the Web Essentials extension, this session should be interesting. He showed that almost everything is possible to extend. It’s only sometimes difficult to find out ‘how’. Creating extensions is mostly done by ‘Search Driven Development’. So use Google to find the info you need to complete your code. One of the reasons is the use of magic strings that are used for hooks in VS.
For extensions you need the Microsoft Visual Studio 2012 SDK. After you installed the VS2012 SDK you get extra extensibility project templates. Most of the times the ‘package’ template is best. To test and debug your extension you just can press F5 then the Experimental Instance of Visual Studio will be launched as a testing container. This special version of VS has it’s own registry settings, so it doesn’t conflict with your normal version. Note to self: try this stuff at home! The session from Alan Smith was mainly about ACS: Azure Control Service. Microsoft is supporting multiple identity providers: Google, Yahoo, Facebook and LiveID accounts. All providers supports only the name identifier claim (which is unique and immutable). Only Google and Yahoo also deliver the name and email address as extra claims. Add federation to the Asp.net project (think about setting the certificate validation to Off in the web.config of you development environment). - Within ACS it’s possible to define extra Role Claims. Presentation was given by three developers of Avanade. There were no real demo’s, only some code on slides. This is a bit disappointing, it’s a developer conference! Targets on iOS, Android, WinRT (all phone and tablets). 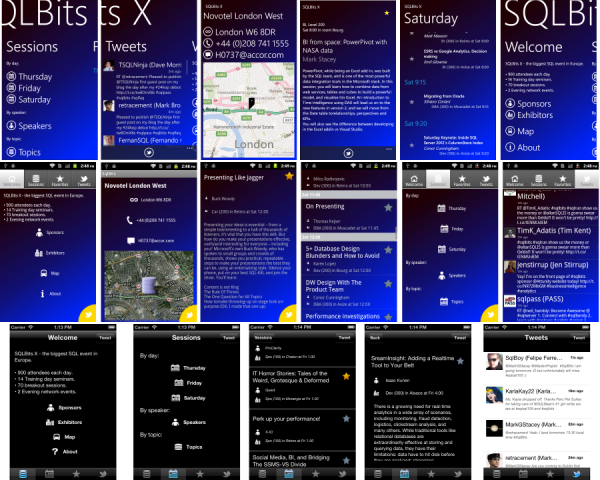 See screenshot example application. Mvvm Cross delivers IoC, plugins, converters and more.. Still need account for all stores (Windows Marketplace = 99 USD per year, Android Play Store = 25 USD per app, Apple iStore = 99 USD per year). Xamarin is a commercial product. Single developer is 299 USD. See pricing for more. Avanade created their on layer on top of Mvvm cross, called Tea Light. Visual Studio has no coding assistence for T4. Avanade developers recommended Tangible T4 Editor. This is also a commercial product. Jeff presentation was covering misc. HTML5 features with a lot of demo’s. He provided each HTML5 feature with a Grade (A to F) and explained us why with Pro’s and Con’s which was nice! See the video, it says it all.. The HTML 5 example code can be downloaded from Jeff Prosise skydrive. The Microsoft Tech Days were held in the Hague and are two days of developer fun. My employer was so friendly to let me attend the conference. This year there were no real new products or major updates to notice. This left space for more niche sessions about mobile development and some IT pro presentations. I’ll try to sum up the visited sessions and the online documentation I found later. I tried to pick sessions I am not really familiar with and where I can learn the most. One of the things that Ben Showed us was how to localize your app for multiple languages. He demonstrated the use of the Multilingual app toolkit to do an initial translation with the help of the Bing Translation service. Very nice & easy! Note: this translation should be reviewed before publishing your app to the store. Alex took us through the history of Entity Framework. Version 1 (which was not really good), 4, 4.1, 4.2 and 5. The last part of his session was about the alpha 3 version of Entity Framework version 6 , is also available on NuGet. DbContext is a wrapper around ObjectContext object. General complaint about ObjectContext object that it contained too much detailed feature that were not commonly used. DbContext is more straight forward in use and you still can use ObjectContext if want to have more advanced features. Batch import of stored procedures. Spatial data types (Can be useful when you’re creating mobile apps with GEO features). Alex showed us a demo to calculate which addresses where within 20 kilometers of the city Veenendaal within(!) a SQL query. Nice! Mads Kristensen presented a nice session about Visual Studio being a good IDE also for web developers. His Web Essentials extension contains a lot of features that makes their lives much easier. Live and real time CSS editing (with/without saving the actual file). He should also the awesome magic of Zen Coding. Example in html template: ul>li*5>a -tab-tab-. This will create a list with 5 anchor tags. Another useful extension is the Image Optimizer. This tool combines SmushIt and PunyPNG for optimizing the images. You should see the recording, Mads had a great talk. Last 2 days I attended the Microsoft Tech Days in the Hague. It was fun and inspiring to see all those technical presentations. I am thinking about to write a review of both days. For now I only would like to share some related links to presentation, code and blogs. Jeff Prosise about HTML 5 (the good, the bad and everything in between) The HTML 5 example code can be downloaded from Jeff Prosise skydrive.